Transform your space into an immersive experience. Our interiors have both the visual impact and the functionality you need to meet your business objectives. Creating a memorable environment involves recognizable and project-specific details. We design custom lighting, furniture, and artwork to take your space to the next level. Creating the right atmosphere means highlighting the existing architecture by incorporating new custom design elements and lighting. We are skilled at both. We design custom millwork and furniture, eg. the bar, the host station, and banquette that anchors the design of the space. Our lighting design solutions involve creating a new lighting layout that coordinates with seating and the selection of new light fixtures that accentuate the interior architecture. Preserving the design concept through construction involves effective construction drawings and guidance throughout the construction process. We create floor plans, schedules, details, and specifications based on project requirements and purpose: permitting, bidding and construction. We also provide project management assistance such as resolving issues on site, clarifying details, and supervising the installation process. We can help you take advantage of outdoor space and increase seating capacity. Designing your patio to match the interior design, thus continuing the dining experience outside. Worried about the weather? We will come up with site specific solutions, like heat lamps placed strategically. 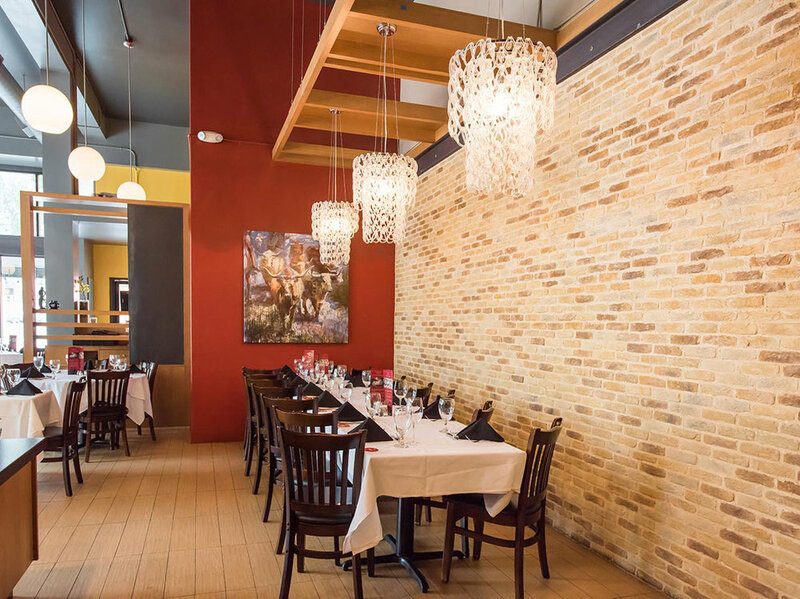 Galeto Brazilian Steakhouse is a 2,500 sq. ft. full service Brazilian style steakhouse in Oakland, CA. The client requested an upscale experience with flexible seating for lunch and dinner. The inspiration for the design came from the name itself. Galeto means ”little chicken” in Portuguese and marinated, grilled chicken is one of the restaurant's signature dishes. The subtly Brazilian color palette compliments the chicken coop inspired millwork in plain sawn white oak metal mesh and structural steel. The existing architecture is accentuated by new custom elements including a communal chef's table defined by a wood canopy, a logo inspired mural at the private dining area, and an elegant salad bar. By designating two areas for large groups, the seating adapts for a range of party sizes. Architectural design details make these areas feel special for guests. A wood canopy and glass link chandeliers defines the semi-private VIP area. And a pendant light grouping at the storefront window makes this area an ideal spot for groups requiring less privacy. We created an intimate private dining area behind the bar. Accentuated by the bar and a full height logo inspired mural featuring slate tile and marble. The sophisticated experience continues in the restrooms featuring luxurious porcelain tiles, oak framed mirrors and built-in vanities. Different color penny tile subtly distinguishes to two restrooms.